Being an ex communist is not always easy. My musical tastes were formed during my youthful communist years One chapter in Latin American history was very troubling and that was the overthrow of Salvador Allende by the Chilean military junta on September 11, 1973. Although I now realise that Chile was being moved towards Marxism and the Soviet orbit, the bloodiness of the coup,and the the horrible brutality still trouble me. As stealthy as I believe the communists to have been, I can not condone the murder of Salvador Allende, the Marxist president who was overthrown. The claim that he committed suicide by shooting himself in the back seems ludicrous. It would have been reasonable to put him on trial for crimes against the constitution, but what the junta did during and after the coup was inexcusable. Salvador Allende became a martyr, much celebrated in song and poetry around the world. One of my favourite songs about Chile and the 1973 coup was the song "Chilenische Metall" by the East German folk rock group "Klaus Renft Combo." Unlike the Puhdys, who sometimes made the regime a bit uncomfortable, the Klaus Renft Combo had a number of overtly political songs that lent East Germany's foreign policy some pretty snappy tunes. They still enjoy a following among devotees of East German rock music. I have included "Chilenische Metall" below. 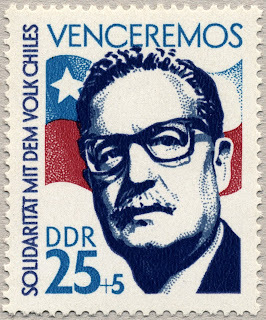 The video has a very interesting slide show of Salvador Allende commemorative stamps from around the world. To underscore the point of the brutality of the coup, I have included an Arlo Guthrie version of a song about the murdered Chilean folk singer Victor Jara that is historically accurate and quite disturbing. The world of communist music remains fascinating to me as does the 1973 coup in Chile. I must candidly admit that American influence and American values do not always travel abroad together. How does one correct that? Jimmy Carter tried to promote democracy in Iran and elsewhere and created one catastrophe after another around the world. There are no easy answers. In looking at the world beyond America's borders, there are far too many questions and precious few answers.